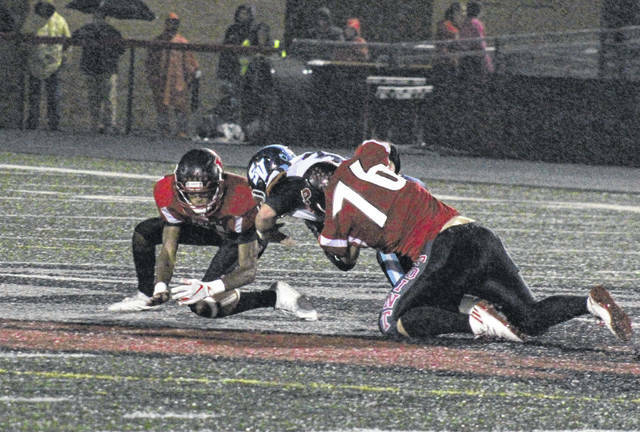 Point Pleasant junior Jovone Johnson (left) scoops a fumble forced by PPHS sophomore Travis Donahue (76), during the Big Blacks’ 24-point setback on Friday in Point Pleasant, W.Va.
POINT PLEASANT, W.Va. — The final score doesn’t always indicate how close two teams are. 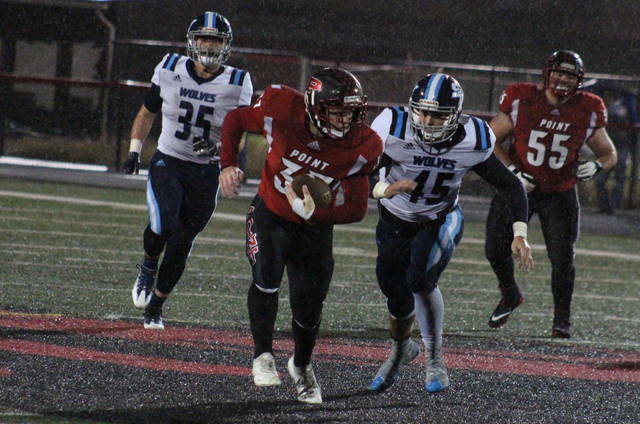 The Point Pleasant football team suffered its first loss of the season at the hands of non-conference guest Spring Valley on Friday at Ohio Valley Bank Track and Field, as the top-ranked Timberwolves wound up defeating the Big Blacks by a 58-34 tally after trailing by two touchdowns at the half. Point Pleasant (7-1) punted on the game’s first possession, but the Big Blacks stopped Spring Valley (9-0) on downs the first time the PPHS defense was on the field. The hosts broke the scoreless tie with 5:57 to go in the first quarter, as Cason Payne found Josh Wamsley for a 20-yard touchdown pass across the middle. The point-after try failed and Point Pleasant’s lead stayed at 6-0. The Timberwolves were held scoreless in the first quarter for just the second time this season, but took a 7-6 lead at the 8:59 mark of the second quarter, as Graeson Malashevich broke a 17-yard touchdown run and Zane Porter kicked in his first of four the extra points. The Big Blacks regained the lead 14 seconds later, as Josh Wamsley returned the ensuing kickoff 98 yards for a touchdown. It’s the longest return in program history, and was followed by Oliver Skeie’s first of four point-after makes, giving the hosts a 13-7 advantage. Spring Valley was back in front by one point with 6:12 left in the half, as Nate Ellis found paydirt on an eight-yard run. The Timberwolves led for just under three minutes, as Payne connected with Josh Wamsley for a 41-yard touchdown pass with 3:13 to go in the period. Spring Valley fumbled the ball away on its next possession, and Point Pleasant made the most of the takeaway, with Payne scoring on a one-yard run with 13 seconds left in the half to give the hosts a 27-14 lead at the break. The Timberwolves received the second half kickoff and 57 seconds later, Ellis broke a 33-yard touchdown run to cut the PPHS lead to six points. The Big Blacks fumbled the ball away on the ensuing kickoff and Spring Valley made the most of the opportunity. Owen Chafin found the end zone on an 11-yard carry with 8:03 to go in the third, giving the guests a 28-27 advantage. Point Pleasant’s next possession was stalled by a penalty and wound up being the final drive for Payne, who left the game with an injury. Spring Valley made its lead 34-27 with 2:23 remaining in the third, as Cody Sharp scored from one-yard out. 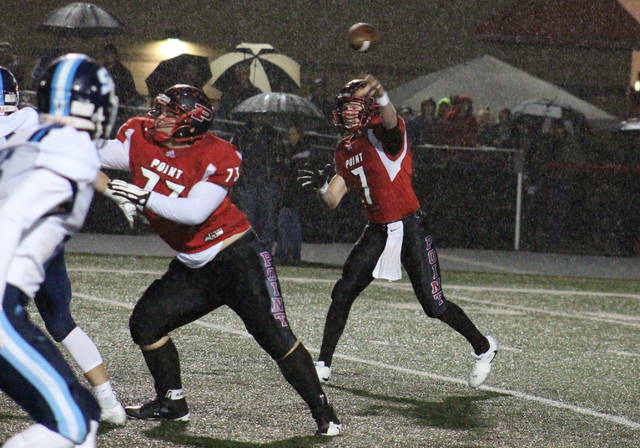 Point Pleasant was held scoreless in the third quarter for the first time this season, and the Timberwolves began to pull away in the fourth quarter. First, Ellis broke a 47-yard touchdown run with 11:41 to go, then David Livingston returned an interception 80 yards for a touchdown with 11:09 left, and finally Ellis found the end zone at the end of a 37-yard run with 8:43 to play. The three fourth quarter touchdowns by SVHS were followed by successful two-point conversion runs by Chafin, Tyson Hall and Isaac Howard. Point Pleasant scored the final touchdown of the night with 3:11 left, as Christian Holland found paydirt on a six-yard run. Following their first setback of the season, PPHS head coach David Darst acknowledged the turn of events at the start of the third quarter sunk the Big Blacks’ chances. Darst also noted that he was proud of his team’s effort against the No. 1 ranked team in Class AAA. The most points SVHS had allowed in a game prior to Friday was 21, which they gave up to both George Washington and Riverside. The Big Blacks earned a 20-to-18 advantage in first downs, despite being outgained by a 469-to-322 edge in total offense. SVHS ran for all of their offensive yards, while Point Pleasant carried the ball for 187 yards and passed for the other 135. 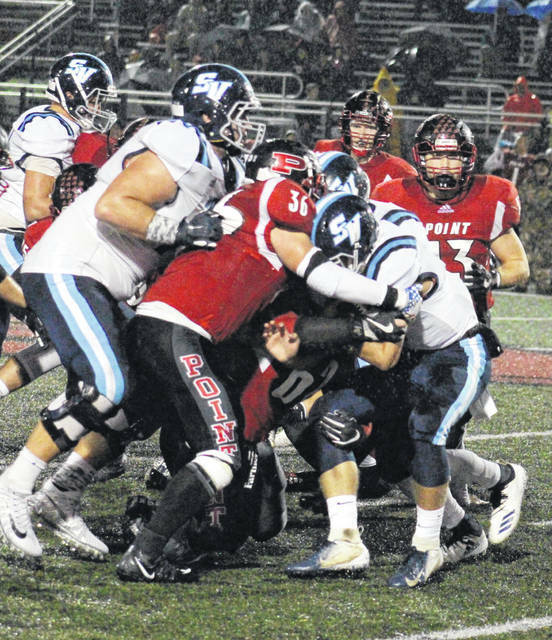 Spring Valley was flagged seven times for 59 yards, while Point Pleasant was sent back five times for 50 yards. Both teams committed three turnovers, with the Timberwolves fumbling the ball away three times, and the Big Blacks losing two fumbles and one interception. Payne was 9-of-18 passing for 122 yards and two touchdowns, while earning a team-best 91 yards on 15 carries with one score on the ground. Hunter Bush completed 3-of-7 passes for 13 yards in relief of Payne. Wamsley had 101 offensive yards, rushing three times for 11 yards and catching a game-best four passes for 90 yards and two touchdowns. Brady Adkins had 56 total yards on 17 carries and one catch, while Holland added 35 yards and a score on six carries. James Musgrave had three receptions for 12 yards for PPHS, Andrew Jones added 13 yards on two grabs, while Joel Beattie and Zane Wamsley had a catch apiece, earning eight and six yards respectively. Ellis led the Timberwolves with 225 yards and four touchdown on 11 attempts. Chafin added 185 yards and one touchdown on 16 carries, while Malashevich earned 37 yards and a touchdown on seven carries. Point Pleasant will look to rebound from its first home loss Week 1 of 2017 on Friday, as the Big Blacks host James Monroe in the regular season finale. SVHS looks to cap off its perfect regular season at home against Huntington on Friday.